The economy of Gwadar, a port for Pakistan in the Balochistan region, is enormously dependent on fishing. However, far too often, fishers lose a good portion of their catches because of unsafe handling practices, which decreases their profit and income. 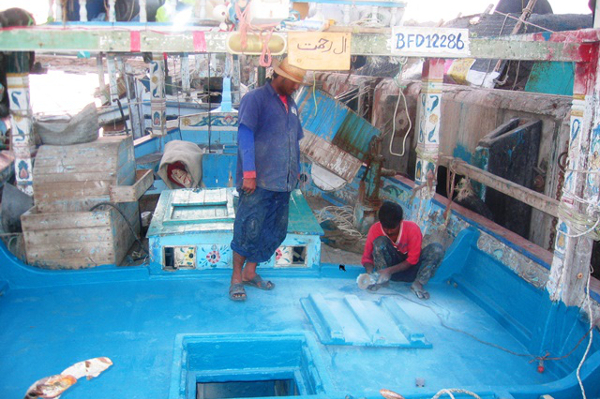 The average fisher in Gwadar uses fish holds made out of wood with an inner lining of galvanized iron sheets, which easily corrode in the water and break into fragments. Unfortunately, these sharp fragments injure their fish, making them susceptible to germs and reducing their market appeal and profitability. The Winrock-implemented Pakistan Agriculture and Cold Chain Development (PACCD) project – funded by the U.S. Department of Agriculture – introduced fisherman to high-quality fiberglass fish holds, which are waterproof, properly insulated, and designed for easy cleaning, drainage, and disinfection. PAACD installed these modified fish holds on 20 boats to help fisherman reduce post-catch loss and improve their market quality. Acceptance has been widespread and, since they were installed, fishers in the region have reported a reduction in post-catch losses of up to 45 percent, leading to greater profit and income.